1. Mistake: Using the same sponge or cloth to clean different areas. Don’t just spread germs around from surface to surface by using the same sponge to clean the bathroom AND the kitchen. Be sure to dedicate a different sponge or cloth to each different room or surface, and always thoroughly clean and sanitize the sponge when you’re done using it. If you use cloths or towels to clean, you can just throw them into the washing machine when you’re finished cleaning, and they’ll be good as new for your next cleaning session. 2. Mistake: Not using the right cleaning supplies or cleaning solutions. Feather dusters are out and Swiffers and dusting cloths are in. Certain cleaning solutions CAN be used on your hardwood floor, but many CANNOT. Bleach will damage certain surfaces but can be safely and effectively used on other surface. Do you know which tools and supplies to use where and how, and which chemicals to use and which to avoid? Many homeowners end up damaging their floors, countertops, upholstery, and natural stone shower tiles simply because they either don’t read the labels, or try to cut corners, or just don’t know the right way to clean an item or surface. What’s the solution? Educate yourself, read labels, and find a great house cleaning company that trains their team members to use the perfect cleaning solutions and tools for each job! 3. Mistake: Waiting too long to clean. Don’t wait until there is mildew growing on the shower curtain and the countertops in the kitchen are coated in food residue. Stay on top of the cleaning or else the job will be way more taxing and time consuming when you finally get around to it! 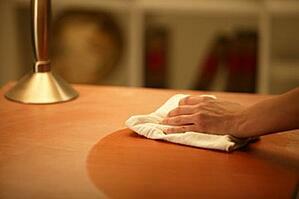 Clean up spills as soon as they happen, and address problems such as mildew and mold as soon as you see it occur. Be sure there is always time in your weekly schedule for house cleaning chores, or better yet, schedule a regular weekly or monthly house cleaning service with a great Jacksonville FL maid service! 4. Mistake: Forgetting germy areas. Many homeowners forget to clean common areas of the home that are covered in germs. Doorknobs and light switches are notoriously germ-ridden and can easily be wiped with a Clorox wipe or cleaning cloth saturated with disinfectant. Don’t forget the face of the TV remote, the panel on the microwave, the handle to the fridge, and other surfaces that get extensive use from all the hands in the family! 5. Mistake: Only tidying up and not REALLY cleaning. While it’s great to spend a few minutes tidying up the house, too many homeowners don’t want to do the dirty work of really cleaning and disinfecting the house. It’s just not enough to put away clothes and run the vacuum, even though those chores are important to do. You also have to scrub the tub and toilet, sweep and mop the floor, scrub the shower tiles and clean the glass, sanitize the sink and countertops, and the list goes on and on. Set aside some time on your calendar, put on your rubber gloves and get scrubbing! Or, better yet, leave the dirty work to the best house cleaning company in your area. A great professional house cleaning team can get your home sparkling and sanitized for you! Homeowners in Jacksonville, Ponte Vedra Beach, Atlantic Beach, and Riverside call on First Coast Home Pros for a myriad of reasons.We’re the best Jacksonville FL cleaning company, trusted by hundreds of repeat clients, and the true cleaning authority.Leave your house cleaning in the hands of our highly rated maid service!